If you are like me, you cannot get enough of The Hunger Games. While I imagine that many of you share my anticipate for the move in March, I have something which I believe could tide you over until then. Smart Pop Books has graciously offered a copy of The Girl Who Was On Fire Move Edition for me to give away to one lucky reader. In The Girl Who Was on Fire, thirteen YA authors take you back to Panem with moving, dark, and funny pieces on Katniss, the Games, Gale and Peeta, reality TV, survival, and more. From the trilogy's darker themes of violence and social control to fashion and weaponry, the collection's exploration of the Hunger Games reveals exactly how rich, and how perilous, protagonist Katniss’ world really is. Still interested? Check out the rules and fill out the form below. 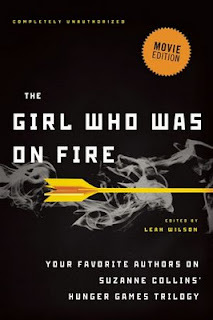 *One reader will win a copy of The Girl Who Was On Fire Movie Edition. *Open to U.S. readers only. Sorry, international folks. *The giveaway will end at 11:59 p.m. on February 5th. This will be great to read right before the movie comes out. Thanks for the chance to win a copy.